Tomorrow the US Navy is set to christen the USS Fort Worth in Galveston, Texas. 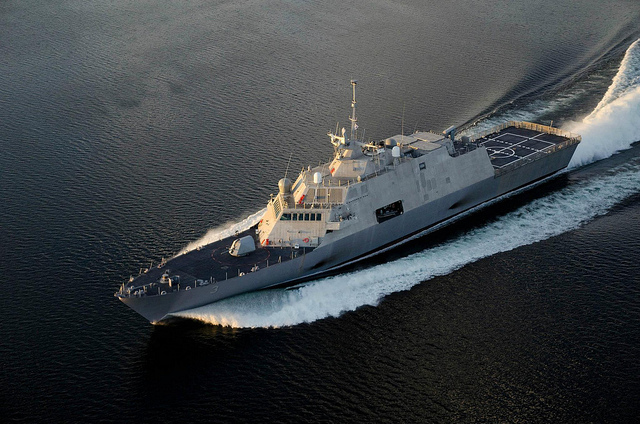 The Fort Worth is the second vessel of Lockheed Martin’s Freedom class Littoral Combat Ships which are designed to operate in a multi-mission role in shallow waters. The Littoral Combat Ship was first devised in the 1990s when the US Navy recognized the need for a multi-purpose vessel to operate in the littoral zone where either deeper draft vessels couldn’t operate or the dangers of the zone (i.e. missile boats, mines, shore launched missiles, etc.) prohibited the exposure of more expensive ships. After the solicitation of various proposals, two designs were chosen for production – Lockheed Martin’s conventional Freedom-class and General Dynamics/Austal’s trimaran Independence class. Despite cost-overruns and serious criticism, the program has forged ahead and, for good or bad, the ships are entering service. The Freedom class variant utilizes a conventional monohull and Lockheed Martin was assisted in its design by veritable naval architecture firm Gibbs & Cox. Gibbs & Cox, founded by America’s greatest naval architect, has designed more than 60% of the US Navy’s surface ships as well as ships for 15 other world navies. Among the Freedom-class’ notable features is its jet propulsion system which allows it to reach speeds of 40 knots/hour, its 12.8 foot draft which enables it to operate in shallower water than most US Navy vessels, the ability to launch and recover watercraft while underway and its 40% re-configurable space. The LCS ships are intended to fulfill the roles previously performed by Oliver Hazard Perry guided missile frigates, MCM Avenger class mine countermeasure vessels and Osprey class coastal mine hunters. In order to perform to possess this flexibility, the ship and its crew must rely on interchangeable mission modules that are installed based on mission needs. These plug and play modules include an anti-submarine warfare (ASW) module, surface warfare module, and mine countermeasures module. The ship can also be configured to support special operations. The thinking behind the modules is that if the Iranians mine the Straits of Hormuz, then the ship’s mine countermeasure module is quickly swapped in (projected time is a couple days) and the ship deployed to sweep the Strait clean. Discounting the fact that much of the mission modules’ substance has yet to be created, this is where the biggest criticism of the ships come into play. As any military officer will attest, you fight with what you’ve got on the battlefield. An LCS outfitted with its surface warfare module is largely ineffective against a diesel submarine strike. Unfortunately, “time out I’ve got to go change modules before we can fight” will never work on the battlefield. Ultimately, the Navy’s LCS fleet will most likely spend most of its time equipped with a single module and 3 or more LCS kept on station to perform dedicated roles. For a more detailed discussion of the LCS’ origins see here.